1. Stir together the olive oil, lemon juice, garlic, rosemary, and salt and pepper in a large bowl. Cut each chicken breast into 2 equal pieces (3 if they are 12 ounces or more) and place in the bowl. Stir together and refrigerate 15 to 30 minutes. 2. Combine ground allspice, coriander or cumin, and cinnamon in a small bowl or ramekin and set aside. 3. Remove chicken from the marinade and pat dry (discard marinade). Place two sheets of plastic wrap (1 large sheet if you have extra-wide wrap) on your work surface, overlapping slightly, to make 1 wide sheet, and brush lightly with olive oil. Place a piece of chicken in the middle of plastic sheet and brush lightly with oil. Cover the chicken with another wide layer of plastic wrap. Working from the center to the outside, pound chicken breast with the flat side of a meat tenderizer until about 1/4 inch thick. (Don’t pound too hard or you’ll tear the meat. If that happens it won’t be the end of the world, you’ll just have a few pieces to cook.) Repeat with the remaining chicken breast pieces. 4. Season pounded chicken breasts with salt and pepper on one side only. Dredge lightly in the flour (you won’t use all of it). 5. Turn oven on low. Heat a wide, heavy skillet over high heat and add the oil. When oil is hot, place one or two pieces of chicken in the pan – however many will fit without crowding the pan. Cook for 1 1/2 minutes, until bottom is browned in spots. Turn over and brown on other side, about 1 1/2 minutes. (Do not overcook or chicken will be dry.) Transfer to a platter or sheet pan and keep warm in the oven. If there is more than a tablespoon of fat in the pan, pour some (but not all) of it off into a jar or bowl. 6. Turn burner heat down to medium. Add ground spices to the pan and when they begin to sizzle add spinach and salt and pepper to taste. Cook, stirring with a wooden spoon and deglazing the bottom of the pan with the liquid that comes off the spinach, until spinach wilts, 2 to 3 minutes. Remove to a platter or to plates and serve with the chicken. 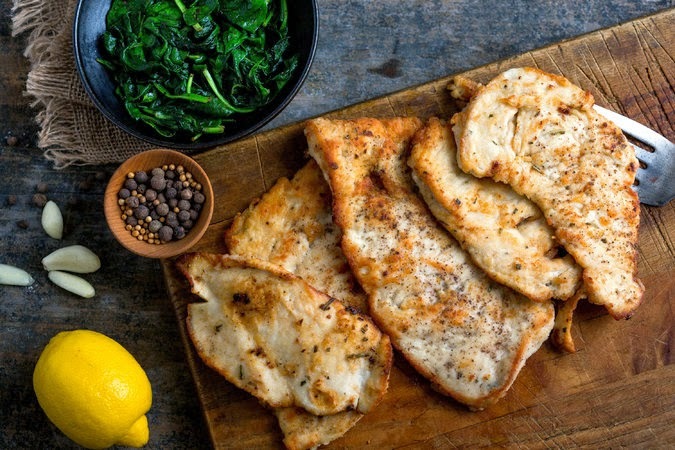 Advance preparation: The chicken breasts can be pounded several hours ahead – but marinate them shortly before cooking — and kept between pieces of plastic in the refrigerator.